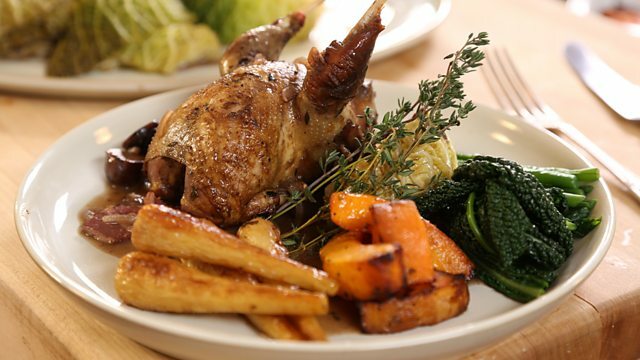 A long slow braise on the hob ensures your partridges will be tender and succulent. Serve with creamy mashed potatoes. Put the juniper seeds in a pestle and mortar and pound until roughly crushed. Sprinkle the juniper seeds over all the partridges, pressing lightly into the skin, and season with salt and freshly ground black pepper. Melt the butter with the oil in a large flame-proof casserole or your largest saucepan over a medium heat. Add the partridges to the casserole, breast-side down, and fry for 1-2 minutes, or until nicely browned. Turn and fry on each of the remaining three sides for a further minute until browned all over. Remove from the casserole and put on a plate. Reduce the heat and add the onion, bacon and thyme to the casserole. Fry gently for 5-6 minutes, or until the onions are softened and the bacon is beginning to brown, stirring regularly. Sprinkle the flour into the pan and stir well. Cook for about five minutes, then add the gin and orange juice and bubble for a few seconds before slowly stirring in the wine and chicken stock. Spoon the cranberry sauce or redcurrant jelly on top, stir in the orange zest and chestnuts and bring to a simmer, stirring constantly. Gently return the partridges to the pan and cover with a lid. Cook over a low heat for 30 minutes. Cut the cabbage into four wedges and remove the tough central core. Remove the casserole from the heat and turn the partridges over. Nestle the cabbage between the birds, cover and continue to cook for a further 30-40 minutes, or until the birds are very tender, the cabbage has softened and the sauce has thickened. Pick out the thyme stalks and adjust the seasoning to taste.